The Trinity Continuum: Æon Kickstarter is LIVE! 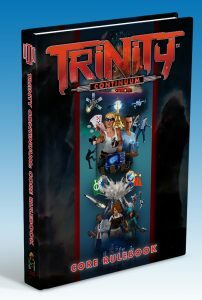 The Kickstarter for the Trinity Continuum core rulebook and the Trinity Continuum: Æon rulebook is now live! The Trinity Continuum Core rules are the foundation for interacting with the Trinity Continuum setting. Using the Storypath System, the Trinity Continuum Core rules provide a contemporary baseline, allowing you to explore modern scenarios in various genres. Present day scenarios involving dedicated investigators, audacious con artists, underground do-gooders, and intrepid explorers can all work within the structure provided. Trinity Continuum: Æon will be the first non-contemporary setting explored on the Trinity Continuum timeline. Set in the year 2123, Trinity Continuum: Æon depicts a future Earth, still in the process of recovery from a devastating war and starting to expand into space. Nations that avoided the brunt of the destruction have transformed into leading political forces, while other regions are either home to struggling survivors in the ruins of their former countries, or living under a fascist regime intent on restoring order at any cost. Bio-engineering technology mixes with psionic orders creating new power structures, while alien contact has been made with mixed results. The Trinity Continuum: Æon setting allows for a variety of play styles, from cyberpunk-like corporate espionage and intrigue to post-apocalyptic survival stories, to space exploration. Yay!! I’ve been waiting for this for years. Trinity was one of the first games I adopted as “MY” game, and I always felt it got short-changed. I’m super excited to see where this amazing team takes it. Also, I’m backer number 6, which is the lowest I think I’ve ever gotten on any KS ever (and I’ve backed quite a few). YAHOO!!!!! really happy to see this up and running. The Trinity world is awesome!